Orvieto is like your fun uncle who has a surprise adventure ready every time you show up. This time we stayed in a room overlooking the Duomo, and on awakening, we watched a couple old Fiats drift into the empty piazza. Fun! After breakfast in the basement, we returned to our window to see that the Fiats had now multiplied to about 30, and the adventure was on. Soon, at least 100 Fiats had gathered, with horns blaring and people swarming like some Roberto Benigni movie. Finally, of course, the bishop arrived to bless the crowd and their cars. And then they were gone. 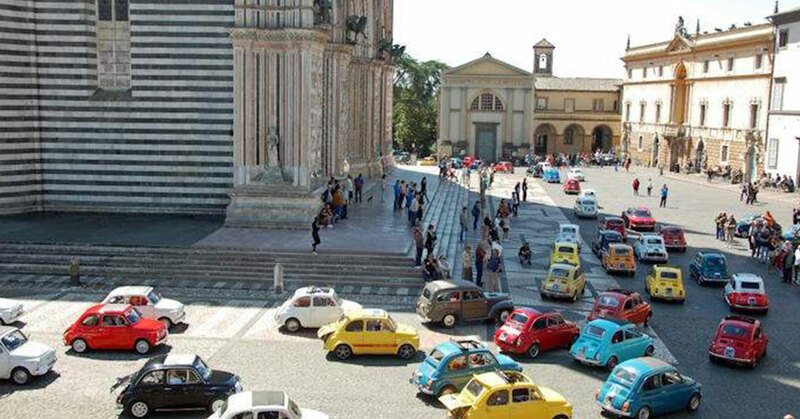 A flash mob, Italian style.